Using side-firing weapons on aircraft can be traced back to 1927, when a concept was demonstrated by fixing a .30 caliber machine gun to the side of a biplane and flying a simple manoeuvre known as a pylon turn. Named after the air racing term, it involved positioning an aircraft in a gentle bank and orbiting it around a fixed point as the gun fired continuously. Yet, when Army brass watched the demonstration, which showed promise, they dismissed it as strange and useless, ordering the idea shelved as they moved on to more familiar things. Another effort was made to garner interest in 1939, as just as war clouds loomed, but it too fell by the wayside. Ultimately, it would take an American commander in Queensland, Australia to force the Air Corps to realise the potential of the idea. In 1943, with the U.S. deep in World War II, Army Air Corps Major Paul “Pappy” Gunn unknowingly laid the seeds of what would become the gunship, when he added four .50 caliber machine guns to the nose of his squadron’s A-20 Havoc light bombers. Using them as strafers, he soon realised that, though additional firepower helped, it remained barely adequate to achieve what he really needed them to do: sink Japanese shipping. Therefore, he sought out a more suitable airframe in B-25D Mitchell medium bombers, and mounted four .50s in the nose, two on either side of the fuselage and three behind the front nose wheel bay. As this arrangement was never part of the original design, all modifications had to be made in the field. 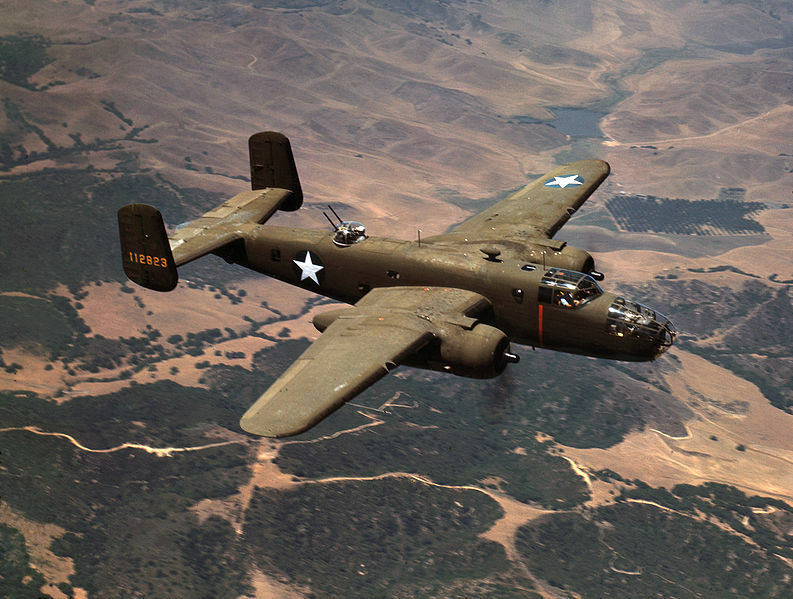 Nevertheless, the improvements worked, and Gunn’s A-20s and B-25s soon flew into action in a big way. From March 2-4, the Battle of the Bismarck Sea raged as aircraft of the U.S. and Australia intercepted a Japanese convoy of eight transports carrying men and material to reinforce Lae, New Guinea. Gunn’s A-20s and B-25s swept in at low level, hammering the hulls and decks of the transport ships and their naval escorts with bombs and tens of thousands of rounds. The attacks were relentless, and at the end of the battle all eight of the transports slipped beneath the waves, smouldering and peppered from bow to stern with bullet holes. The modifications worked, and the gunships success echoed back to designers who, months later, produced G and H models of the Mitchell sporting armaments up to 75mm. Just as quick as it arrived though, the Mitchell ended its run as the premier gunship of the era with the arrival of a new kid on the block, one even more purpose built for task. 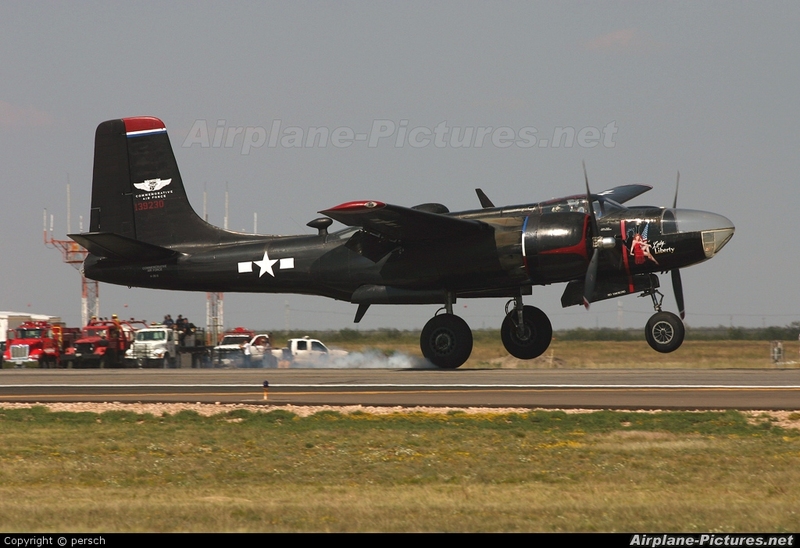 The A-26 Invader. This light-attack, two-man aircraft, which debuted in 1944, unfortunately played second fiddle to the more famous Mitchell’s exploits until after the war’s end, when the ensuing years caused it to make a name for itself as the definitive gunship until the mid 1960s. The Invader’s reputation started when Korea exploded into war in 1950. Armed with up to 14 .50 caliber guns (8 in the nose, 6 in the wings) along with its bombs and rockets, the Invader began tearing up enemy vehicles trains and positions, often at night. Crews developed new tactics like the Hunter-Killer, where the Hunter roved the countryside looking for headlights or any other sign of enemy activity. If spotted, Communist drivers would shut off their lights, unaware the departing aircraft had radioed to the Killer, which often caught them falling for the ploy and turning them back on. 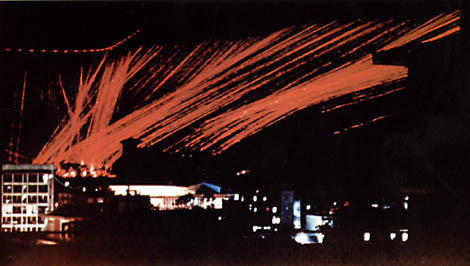 The result was often dozens of explosions and swirling torches licking at the sky. So good were the Invaders that no matter what tactics they used, many an enemy machine fell to them. By the end of the war, they were credited with 38,500 trucks, 406 locomotives and 3,700 railway cars dispatched, in addition to seven enemy aircraft destroyed on the ground. Not much longer after, that they were carving out the jungle in a place where it would see its most lengthy service: Vietnam. Supplied by the U.S. and now sporting French tri-colours, the A-26 was used heavily in the First Indochina War, and was involved, along with many other aircraft, in the futile effort to prevent the garrison at Dien Bien Phu from being overrun. And while the French left southeast Asia in disgrace, that in no way affected the A-26, which returned with the U.S. to Thailand in 1960 to assist the Laotian government fighting the Pathet Lao communists, then back to the new nation of South Vietnam in 1962 to begin its encore and final performance. Meanwhile, at the same time back in the U.S., with the growing prospects of engaging in so-called ‘limited wars‘ like Vietnam, the Air Force created a panel to study ways of defending strategic hamlets and forts throughout the country using new techniques. 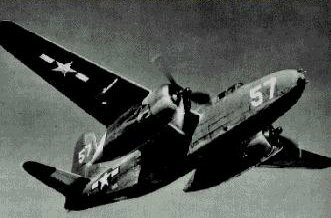 Good as it was, the A-26 simply didn’t have the ability to provide the sustained suppressive fire needed to break off massed attacks that might last for hours. For this, the old concept of side firing guns on a loitering aircraft was again pulled from the shelf, and this time made into reality. The program, designated as Project Tail Chaser, used a modified Convair C-131 twin-engine transport, with cameras placed in windows where guns would be. In several tests, the aircraft banked, flew the pylon turn and proved the concept feasible. But, before the next step of adding weapons could begin, a military project’s greatest enemy, lack of funds, reared its head and caused years of delays. Finally, live-fire tests were conducted in the summer of 1964 using older C-47 twin-engine transports from Eglin Air Force Base, and the program picked up steam again. 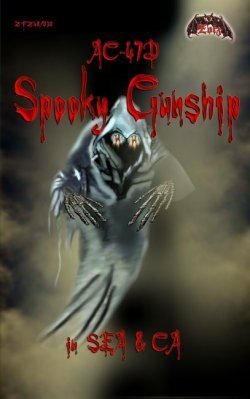 Under the command of Captain Ron Terry, Project Gunship 1 was created, and a low-hour C-47 airframe was pulled offline in Vietnam and refurbished with a new and deadly cargo: three six-barrelled .30 caliber miniguns. Each minigun was capable of firing 6,000 rounds per minute. They were mounted in pods on the plane’s left side, two firing through portholes and one firing out the cargo door. 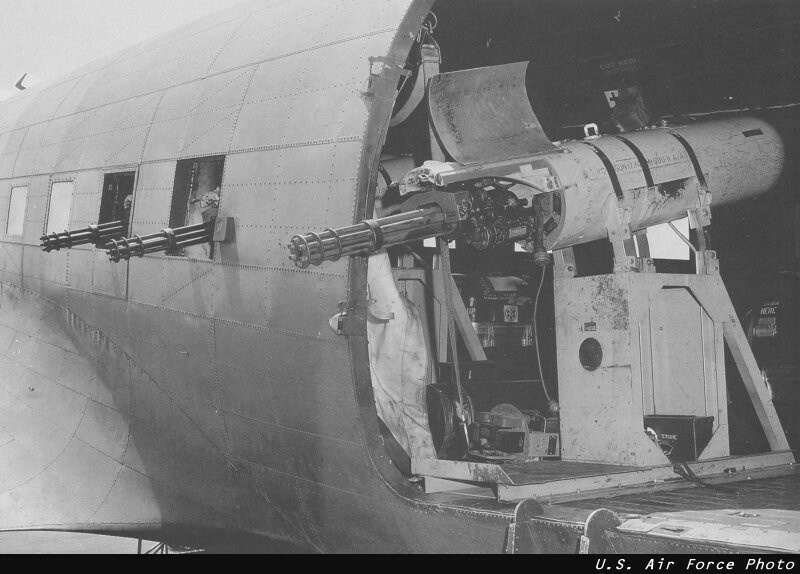 In addition, 24,000 rounds were carried to feed the guns, which were aimed by the pilot looking through a sight fixed to his left. The trigger was a button on the control wheel that, when pressed, sent a swath of fire the size of a football field that could be held and adjusted as long as the pilot stayed in his turn. The result, as its new crews found, was absolute carnage in tests, often leaving targets torn asunder in tiny pieces on the wind. Most of those on the ground who saw it at work were often rendered speechless. Confidence was high among all that this could be a game changer. The AC-47 started its bank and a stream of fire leaped from the sky to the ground, surprising the defenders and annihilating the attackers, who never saw how the judgment rained down to tear a path through their ranks and the jungle itself. With such a high rate of fire and every fifth round a tracer, it seemed a massive red tornado started to swirl outside the camp’s perimeter, sweeping all before it into dust. The AC-47 continued its slow trek in a great circle, as more tracers by the hundreds ricocheted skyward after hitting the ground, making it appear as if Hell itself was pushing its way to the surface and the earth was giving way. Nothing of flesh survived its onslaught. And when the firing stopped a few minutes later, a haze smelling of gunpowder settled over the night. The outpost was safe. Not even the plaintive cry of a wounded guerrilla was heard. 4,500 hundred rounds had been expended. The saved men offered profuse thanks before a call came from another outpost known as Trung Hung, twenty miles away. A few minutes later, and new witnesses watched in amazement as the sky sent another red tongue to the earth to feed off the blood of more unsuspecting attackers. 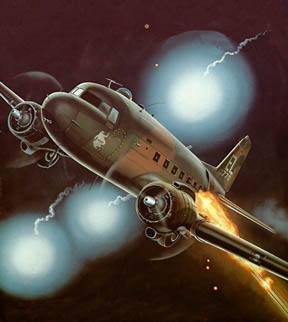 Once the AC-47 returned to base, it wasn’t long before the destruction it had wrought that night began making rounds. In the days that followed, more requests came, and the bird cranked up and winged off to do its duty, never failing to break up an attack, no matter if it took hours. 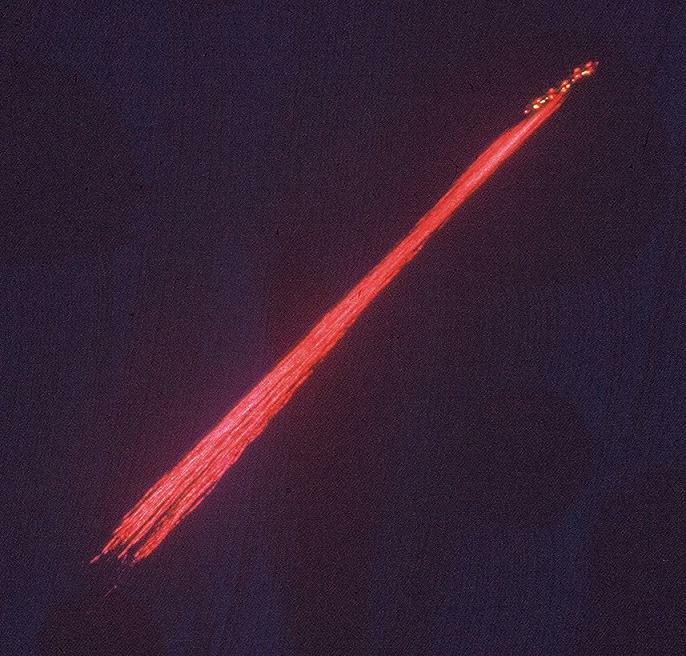 It came to be during one of these night missions to protect a hamlet on the Mekong Delta in early 1965, another witness to its power, a Stars and Stripes reporter watched in awe and wrote how the stream of tracers reminded him of a dragon’s breath. After reading the story, the commanding officer of the wing said, “Well I’ll be damned, Puff the Magic Dragon,” referencing a children’s song made popular by the folk group Peter, Paul and Mary. That was all it took, forever more, the solitary AC-47 and those that joined it later, carried the call sign ‘Puff.’ Even the Vietcong got in on the action, believing that the monster was real, and that shooting at it would only make it angry. It did. On February 8, 1965, Puff located hundreds of Vietcong on a hillside firing at it and let loose, staying on station for four hours and firing over 20,000 rounds to leave the place bereft of trees and stalk. Maybe it was necessary to cover the body parts of the 300 plus enemy that had been gathering for an offensive. Three years later, it was during in the siege of Khe Sanh in 1968 that the AC-47s, now expanded and operating countrywide using the call sign ‘Spooky’, gave its greatest and lengthiest service. Also it might be said, it proved to be the slow demise for the 47s used by the U.S. in the gunship role. Khe Sanh was a remote Marine hilltop outpost in the northwest part of Vietnam. Situated near the Laotian border, the North Vietnamese had brought it under siege with the start of the Tet offensive on January 31st, 1968. President Johnson became so worried and obsessed with its fate that he demanded hourly updates on it as the mightiest warplanes in the U.S. inventory, including the B-52, unloaded thousands of tons of ordnance and literally changed the topography day-to-day around the site. When dusk came, the NVA emerged from their deep tunnels and moved closer to the perimeter, only to have an AC-47 massacre them each time. This act was replayed countless times during the siege, and planes relieved each other making sure there was always a gunship orbiting the base. They stayed night after night for months on end until the siege was broken. With this in mind, though the B52 may have been the airborne star of the event, an equal case could be made for the AC-47, who kept the enemy reeling when they were considered ‘danger close,’ and kept them from storming the base using one of their favourite weapons, Night. 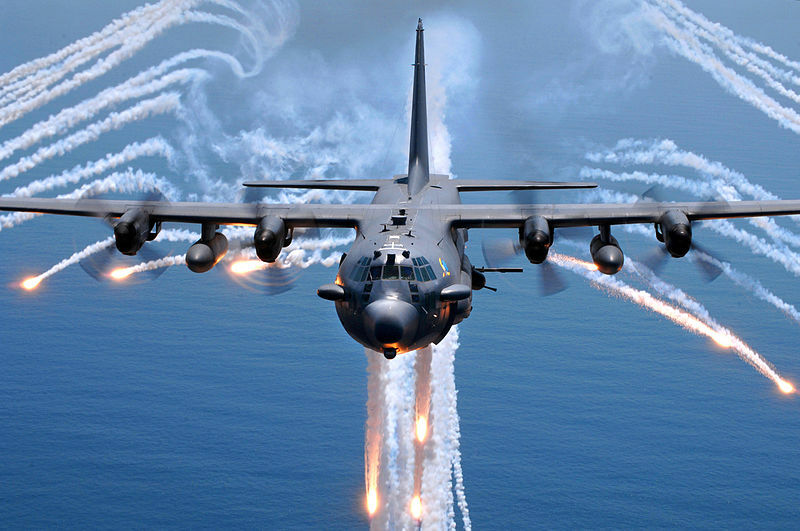 After 1968, the AC-47s slowly began to be supplanted and replaced by both the Lockheed AC-130 Spectre (Project Gunship 2) and AC-119 Stinger (Project Gunship 3). Once numbers of these aircraft were in theatre, the AC-47s ranks grew smaller still until just a handful were serving into the 1970s, when they were withdrawn in favour of the Spectre. 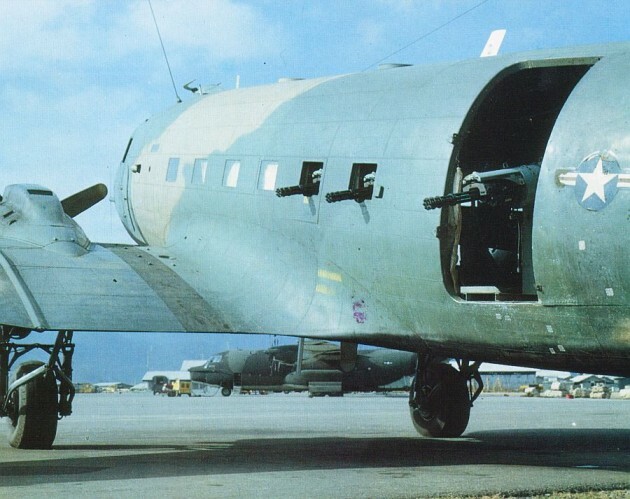 Variants of the AC-47 still serve today as gunships in South America, though without the miniguns that gave it its characteristic moniker.